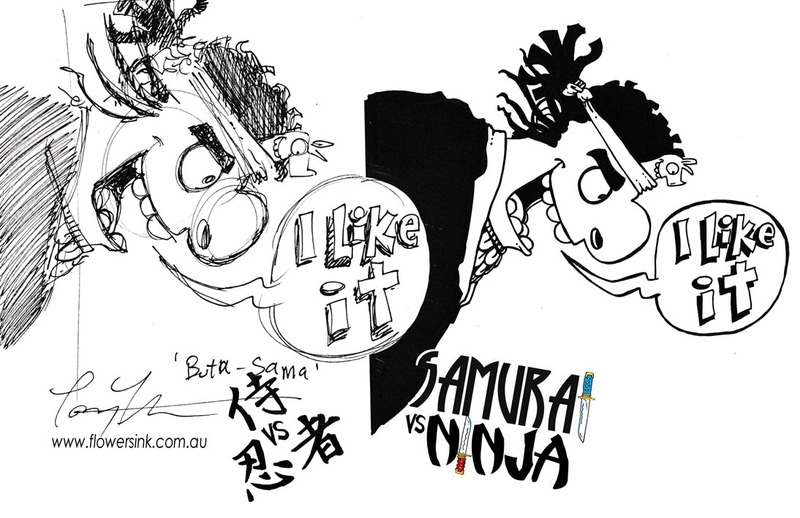 A quick sample from my new book series with Nick Falk, Samurai vs Ninja. The books will be available in March 2015. This is Buta Sama (head of the Ninjas) in sketch and finished illustration stages. I now use a light pad (light box) to transfer sketch images to finished artwork. The steps I follow are a standard technique. I sketch in colour pencil first. This allows me to see the difference between pencil sketch line work and ink sketch line work on the light pad. Then I ink the pencil sketch. Trying to keep the line work loose and full of movement. Then by placing it on the light pad with a blank sheet of paper on top. I transfer the image to the top layer of paper. Once the basic line work is done. I then add detail to finish the illustration.